Below you'll find a collection of tutorials that are focused on aspects of landscape drawing and painting. The medium and technique are different for each tutorial and the approach to each subject will vary as well. Learn how to paint a landscape using the new medium of PanPastels in this lesson. Learn how to paint a landscape with soft and hard pastels using a structured and ordered approach of applying color. A look at painting 3 different types of trees with watercolor. Charcoal pencils are used to create a landscape sketch in this tutorial. Learn how to create the illusion of realistic leaves with colored pencils in this tutorial. Landscapes can be developed quickly with pastels. This tutorial looks at strategies for developing a landscape painting in a short amount of time. Use PanPastels to create atmospheric effects and soft pastels to add the details in this landscape demonstration. Part one of a series on painting the landscape with watercolors using warm and cool hues to produce contrast and space. Part two of a series on painting the landscape with watercolors using warm and cool hues to produce contrast and space. Part one of a series on painting a cityscape with watercolor. Techniques for simplification are presented and implemented. Part two of a series on painting a cityscape with watercolor. The cityscape painting is completed by developing details. Learn how to create the illusion of rocks using a limited palette and Graphitint pencils in this recorded Live Lesson. This recorded Live Lesson looks at drawing water with oil pastels. Create a landscape with oil pastels in this module from "The Secrets to Drawing" video course. Create a landscape drawing with soft and hard pastels in this module from "The Secrets to Drawing" video course. Learn how to paint a seascape using acrylic paint in this video that features excerpts from a two hour lesson. Learn how to use the right marks to create the necessary illusions in a landscape painting. Recorded Live Lesson. Time lapse of a tree drawn from imagination using colored pencils. A structured approach to drawing any type of tree in a realistic manner. Learn how easy it is to draw grass in this video tutorial. Learn an ordered approach to organizing a landscape drawing in this module. Complete a landscape drawing with colored pencils by finishing the middle ground and the foreground. A landscape demonstration recorded from a live lesson using the new medium of PanPastels. Learn two very different approaches to drawing clouds in this recorded live demonstration. Learn how to create the illusion of waves using watercolor in this recorded live lesson. How to draw rocks in the landscape. Time lapse of a pastel landscape sketch from a recorded live lesson. Learn how to use pastel to create a quick drawing of a landscape in this full length video tutorial. The element of space is explored in this module from "The Secrets to Drawing" video course. One point perspective is an easy way to create the illusion of space using a structured approach. Learn how to use it in this module from "The Secrets to Drawing" video course. Learn how to draw three dimensional forms in space with two point perspective in this module from "The Secrets to Drawing" video course. Learn how draw with three point perspective in this module from "The Secrets to Drawing" video course. Learn the basics of linear perspective in this recorded live lesson on one point perspective. Learn how to create the illusion of space through two point perspective in this recorded live lesson on two point perspective. Learn how to draw with three point perspective in this recorded live lesson on three point perspective. An in-depth look at drawing with one point perspective. Learn how to draw with three point perspective in this video drawing lesson. Learn how to use masking fluid to create a watercolor waterfall in this recorded Live Lesson. Gouache (Opaque Watercolor) painting demonstration of a tree. Excerpts from the 2 hour watercolor and pen and ink tutorial. Learn how to draw an old barn using ink wash and pen and ink techniques in this module from "The Secrets to Drawing" video course. Time lapse of an artistic approach to crayon etching using white undertones. An old building is rendered by creating "scratchboard" with crayons and ink in this recorded live lesson. Learn how create texture with line in this drawing tutorial that features excerpts of a 1 hour lesson. A simple scene is developed using a variety of pen and ink techniques in this recorded live lesson. Time lapse of a live lesson of an oil pastel drawing of a race car. Learn how to draw a racecar using oil pastels in this full length video demonstration. Use positive and negative space to create a floating cut paper image of a house on a hill. Learn how in this video lesson. Use oils to create an Impressionist landscape using strong color and light in this module from the "Oil Painting Master Series" video course. 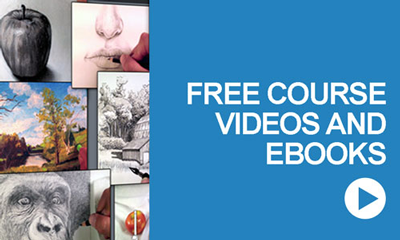 Learn how to draw the landscape with chalk or soft pastels in this free drawing lesson video. Learn the tools of the trade in pastel landscape drawing in this module from "Pastel Landscape Mastery" - Part 1 "Materials and Surfaces". Learn how to create the illusion of space using atmospheric perspective in this module from "Pastel Landscape Mastery" - Part 2 "Atmospheric Perspective"
Learn how to draw a realistic sky using pastels in this module from "Pastel Landscape Mastery" - Part 3 "The Sky". Learn how to draw trees in a pastel landscape in this module from "Pastel Landscape Mastery" - Part 4 "Trees and Foliage"
Learn how to add rocks to a pastel landscape drawing in this module from "Pastel Landscape Mastery" - Part 5 "Rocks in the Landscape". Learn how draw architectural elements in a pastel landscape drawing in this module from "Pastel Landscape Mastery" - Part 6 "Architectural Elements". Learn how draw water in a pastel landscape drawing in this module from "Pastel Landscape Mastery" - Part 7 "Water"
Learn how silhouettes can be used to create focal points and enhance contrast in a landscape drawing in this module from "Pastel Landscape Mastery" - Part 8 "Silhouettes". Learn how to add large quantites of pigment using the dry wash technique in this module from "Pastel Landscape Mastery"- Part 9 "Dry Wash". Learn how water can be added to soft pastels to create effects in this module from "Pastel Landscape Mastery" - Part 10 "Wet Wash". Learn the technique known as "scumbling" in which opaque, but light, applications of pastels are applied to the surface in this module from "Pastel Landscape Mastery" - Part 11 "Scumbling". Learn the technique known as “feathering” in which short strokes of pastel are layered to create depth in color tone and texture in this module from "Pastel Landscape Mastery" - Part 12 "Feathering". Learn how to use oil pastels to create a landscape painting in this module from "Pastel Landscape Mastery"- Part 13 "Oil Pastels". Learn how to paint with painting knives in this video in which a landscape painting is created. A look at painting simple clouds in an oil landscape. Learn how to use basic watercolor techniques in this free painting lesson video.